Researchers in California have reported how carbon sequestration in the ocean can be made 500 times faster, by simply adding a common enzyme to the process. Scientists at the California Institute of Technology (Caltech) and the University of Southern California (USC) have found a way to accelerate the slow part of the chemical reaction that helps Earth to safely lock away, or sequester, carbon dioxide into the ocean. Simply adding a common enzyme to the mix can make the rate-limiting part of the process go 500 times faster. Their research appears in Proceedings of the National Academy of Sciences. The team studied calcite – a form of calcium carbonate – dissolving in seawater and measured how fast it occurs at a molecular level. For this, they used isotopic labelling and two methods for measuring isotope ratios in solutions and solids. "Although a seemingly straightforward problem, the kinetics of the reaction is poorly understood," said Will Berelson, co-author and a Professor of Earth Sciences at USC. Calcite is a mineral made of calcium, carbon, and oxygen that is more commonly known as the sedimentary precursor to limestone and marble. In the ocean, calcite is a sediment formed from the shells of organisms, like plankton, that have died and sunk to the seafloor. 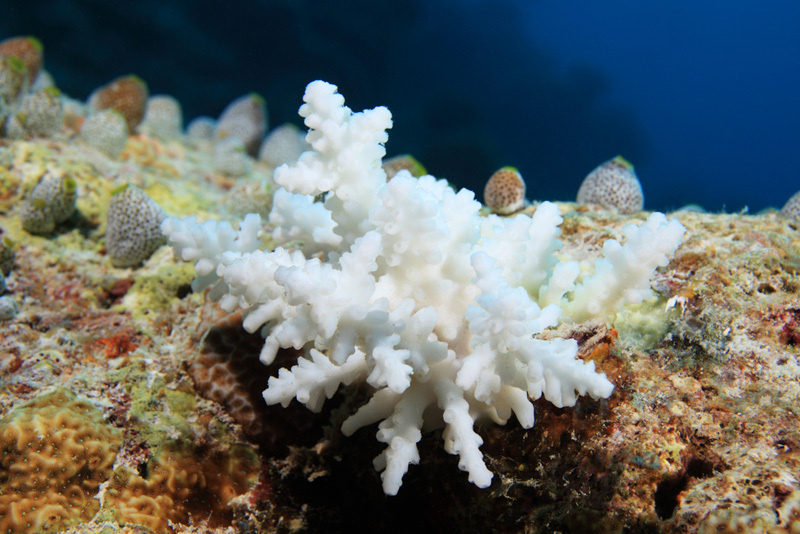 Calcium carbonate is also the material that makes up coral reefs – the exoskeleton of the coral polyp. With atmospheric carbon dioxide levels having risen past 400 parts per million, ocean surfaces have absorbed more and more of that greenhouse gas. This is part of a natural buffering process – the oceans act as a major reservoir of carbon dioxide, currently holding 50 times as much as the atmosphere. However, there is a second, slower, buffering process. Carbon dioxide is an acid in seawater, just like in carbonated sodas (which is part of why they dissolve your tooth enamel). Acidified water on the ocean surface will eventually circulate to the deep, where it can react with dead calcium carbonate shells on the seafloor and neutralise the added carbon dioxide. This process takes tens of thousands of years, however, and meanwhile, the ever-more acidic surface waters eat away at coral reefs. But how quickly will the coral dissolve? "We decided to tackle this problem because it's kind of embarrassing, the state of knowledge expressed in the literature," says Jess Adkins, Professor of Geochemistry and Global Environmental Science at Caltech. "We can't tell you how quickly the coral is going to dissolve." Earlier methods relied on measuring the changing pH of seawater as calcium carbonate dissolved, and inferring dissolution rates from that (as calcium carbonate dissolves, it raises the pH of water, making it less acidic). Subhas and Adkins instead opted to use isotopic labelling. Carbon atoms exist in two stable forms in nature. About 98.9% is carbon-12, which has six protons and six neutrons. The other 1.1% is carbon-13, containing one extra neutron. 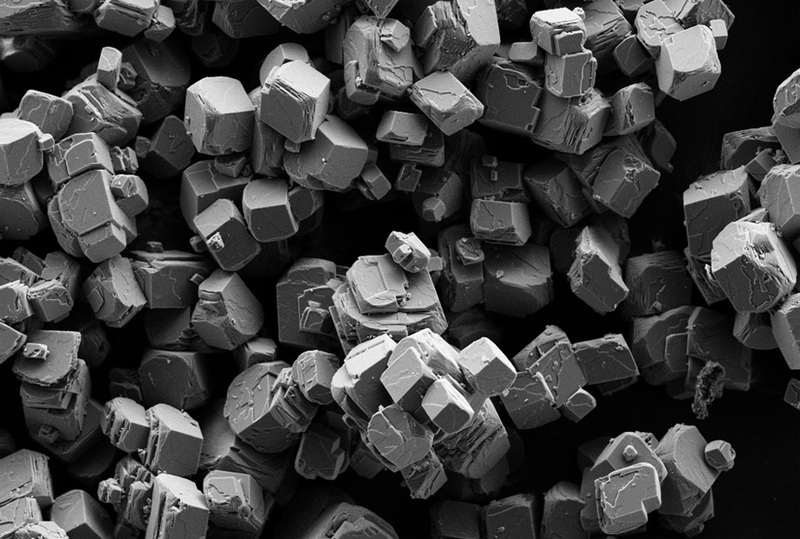 Subhas and Adkins engineered a sample of calcite made entirely of the rare carbon-13, and then dissolved it in seawater. By measuring the change in ratio of carbon-12 to carbon-13 in the seawater over time, they were able to quantify the dissolution at a molecular level. Their method proved to be around 200 times more sensitive than comparable techniques for studying the process. On paper, the reaction is fairly straightforward: water plus carbon dioxide plus calcium carbonate equals dissolved calcium and bicarbonate ions. But in practice it is more complex. "Somehow, calcium carbonate decides to spontaneously slice itself in half," explains Adkins. "But what is the actual chemical path that reaction takes?" Studying the process in detail with a secondary ion mass spectrometer (which analyses the surface of a solid by bombarding it with a beam of ions) and a cavity ringdown spectrometer (which determines the 13C/12C ratio in solution), the researchers discovered that the slow part of the reaction is the conversion of carbon dioxide and water into carbonic acid. "This reaction has been overlooked," says Subhas. "The slow step is making and breaking carbon-oxygen bonds. They don't like to break; they're stable forms." Armed with this knowledge, they added the enzyme carbonic anhydrase – which helps maintain the pH balance of blood in humans and other animals – and were able to speed up the reaction by orders of magnitude. "This is one of those rare moments in the arc of one's career where you just go, 'I just discovered something no one ever knew,'" says Adkins. There is a long way to go before this process could be scaled up (perhaps via a system of pipelines, or underwater delivery drones? ), but in the future it could play a part in restoring the health of our oceans.